Adorn your art and photos in this lilac purple frame, designed by Artist Jane Seymour. 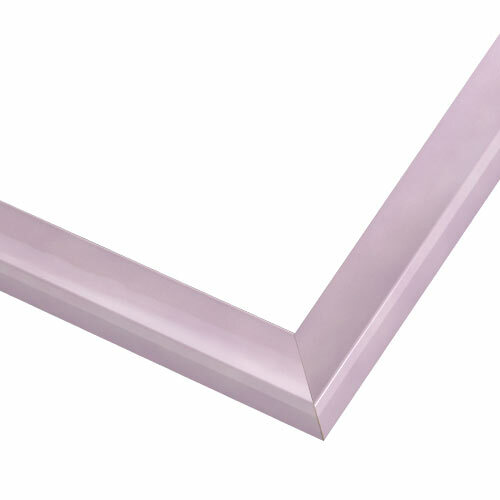 This simple yet elegant frame is finished in a light purple lacquer. The classic profile makes it the perfect addition to any art or photo, while the soft and alluring mottled texture resembles waves crashing on the shore, adding unexpected interest. Think of this wood picture frame as the finishing touch to your masterpiece: perfect for framing kids’ art, illustrations in the family room, vibrant photography and more. A beautiful color that tied together two posters I have long wanted to frame - I searched for purple and was so happy to see this slim, elegant muted lilac color. Simple, elegant style. Matching color strip around my picture at the matt board. I wanted a lavender frame for my picture. Aaron Bros didn't have one so I'm ordering it on line. I needed something light an airy to complement a cross stitch picture. How true to life is the color on the webpage? BEST ANSWER: Hello! We do our best to capture the true color of each frame for our catalog and website. We suggest ordering free 3" samples of the frame so that you may see the frame before making a purchase. Happy Framing!